As steam traction was run down on BR lines, so interest in industrial systems rose. There were many places around the country with a wealth of ancient and modern machines still hard at work in the late 1960s and early 1970s. Here are just a few to start with, the pictures are in chronological order, oldest first. Plenty more to be added! The Leighton Buzzard Light Railway was built in 1919 to carry sand extracted from various local quarries to the standard gauge line from Leighton Buzzard to Dunstable. 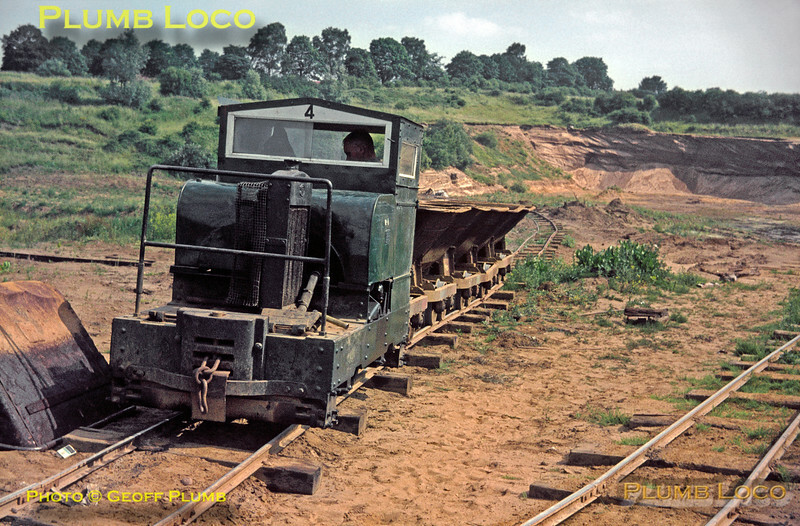 It was 2' 0" gauge (610mm) and apart from the first couple of years was operated by internal combustion locos, mainly a variety of Simplex machines. Here Simplex No.4 is at the head of a train of empty Hudson tipper wagons, perhaps waiting for them to be loaded at the Billington Road Quarry (aka Pratt's Pit Quarry? ), then across Billington Road on the level to the transhipment area. Note the very temporary nature of the track. Today, this area, which is almost adjacent to the existing terminus of the preserved line at Page's Park, is now covered by a new housing estate. Saturday 1st July 1967. Slide No. 2815.